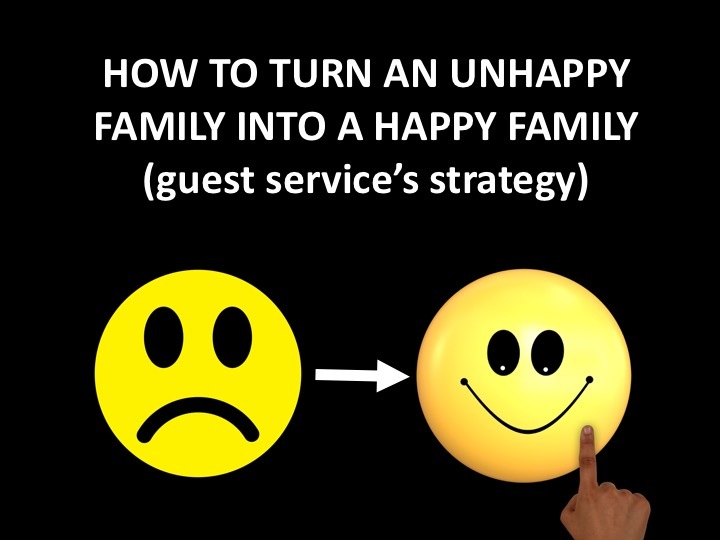 No matter how good your guest services team is, there will be times when a family will get upset about something. Here are some practical steps you can take to turn an unhappy family into a happy family. Step One: Acknowledge that they are upset. Sometimes they will be unhappy because you are at fault. Other times, you will not be at fault even though they think you are. Whether it's your fault or not isn't the issue. Lay aside your feelings and focus on the fact that they are unhappy. Getting defensive will only escalate their feelings. Step Two: Ask the right questions. Use questions like, "Can you tell me what happened?" or "Please tell me why you are upset?" This shows the family that you want to partner with them to find a solution. It also sets up the next step which is the most important part of the process. Step Three: Listen. Resist the urge to immediately jump in and fix the problem. Listen first. More than anything, the family wants to be heard and have the opportunity to tell you why they are unhappy. Listen carefully. Listen to understand. Give the family your complete attention. Step Four: Make sure they understand that you understand. Once they have shared why they are unhappy, repeat what they said back to them. Help them see that you understand why they are unhappy. Step Five: Show empathy and apologize. This will help lower their stress level and has a calming effect. Here's an example. "I understand why you are unhappy. I would be upset as well if my child was crying and I wasn't paged. I apologize that we forgot to ask if you wanted to be paged if your child started crying." Step Six: Find out exactly what they need and work toward a solution. If you know what will make them happy, then offer the solution. If you are not quite sure, then ask them how you can make them happy. The goal is to turn an unhappy family into a happy family. Step Seven: Follow up. A few days after the situation has been resolved, follow up with the family to make sure they are happy with how things were handled. It is also very beneficial to send them a hand written note or even a gift. Here's a real-life, situation I faced with an unhappy family. We took the preschoolers out of their rooms to a common area for chapel once the service had started and then they returned to their rooms after chapel. We accidentally took a child into a different room than he had been dropped off in. When the parents came for pick-up, their child was not in the room where they had left him. The parents assumed the worst and thought someone else had gotten their child. They freaked out and rightly so. #1 - We acknowledged that they were upset and rightfully so. #2 - We asked the parents and volunteers in the room questions to find out what had happened. #3 - We listened as they explained. #4 - We repeated back the facts that had been shared. #5 - We showed empathy and apologized that they child was not in the room. #6 - We quickly accessed the situation and assured them we would find their child. We checked the other rooms and found their child in the other room. # 7 - We explained where we had make the mistake and assured them it would not happen again. # 8 - Later that week, we called them to confirm that we had reinforced our policy and procedures to make sure they were followed carefully. # 9 - We sent them a handwritten note apologizing again and thanking them for their patience. We included a gift card for the family. There is a lot at stake when you are ministering to an unhappy family. If they remain unhappy, you are likely to lose them. But if you are able to turn them into a happy family, you will gain their trust and respect. Whether they remain unhappy or not, depends on how well you and your team treat them in the midst of their unhappiness. Train your team with these steps and you'll see lots of frowns turn into smiles.